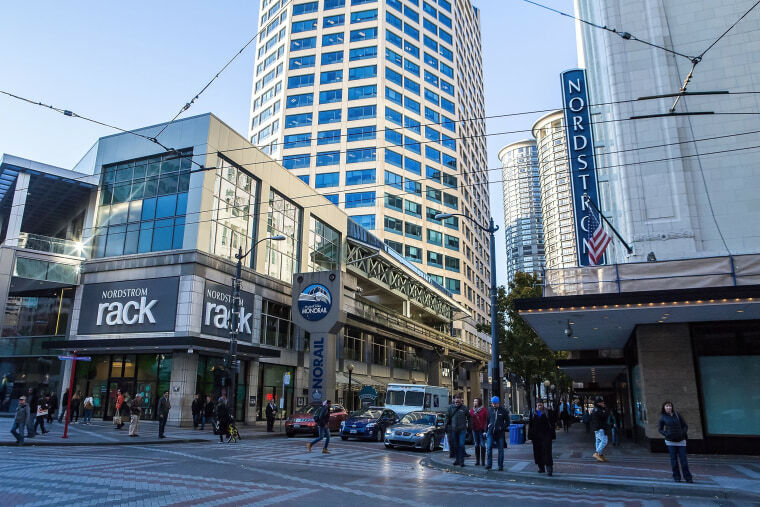 Downtown Seattle on November 12, 2014 Suzi Pratt / Getty Images for Nordstrom Inc.
Carol Malone, 62, lived a lifetime in the Ida B. Wells Housing Projects in Chicago before finding herself scrambling for housing after the apartment complex was demolished in 2011. Malone, who at the time was a security guard, found a modest apartment on the city's South Side. But soon, the rent and the cost of living began to rise as the neighborhood's landscape changed and lavish lakefront brownstones replaced more affordably priced and modest brick buildings. After six months, she just couldn't keep up with rising rent. Malone moved to Waukegan, a suburb north of Chicago, 10 miles from the Wisconsin border. Though Republican candidate Donald Trump has used the term “inner-city" to exemplify poverty, "lost opportunity” and “hell,” the reality is that majority of America’s poor aren’t in inner-cities. They live in the suburbs. Situations like Malone’s are not uncommon among America’s poor, who are overly-represented in the nation's suburbs, according to a report by Brookings Institute. The phenomenon is especially acute in cities where more more affluent individuals are moving back into cities to be closer to jobs and city amenities. Housing prices within "center-cities" have rapidly increased over the last two decades, according to data from the Federal Housing Finance Agency. But moving to the suburbs presents a variety of challenges, Allard said. There are problems of little or no public transportation, fewer jobs that pay a living wage for those without college degrees, and fewer social service "safety nets" that tend to be more robust in cities, experts on poverty say. Malone learned this the hard way. Because suburbs tend to be more spread out and offer less in the way of public transportation, dependence on cars, along with high gas and insurance cost become unexpected expenditures for those whose budgets are already spread thin, Allrad said. Many times it comes down to buying food or gas. "Whatever money I got, I was using for gas," said Jalisa McGowen, 28, who became homeless after losing low-income housing in the Seattle area. McGowen went from shelter to shelter after becoming financially squeezed out of Seattle in 2008. She is now in Section 8 housing in the suburb of Auburn, 25 miles south of the city. "Its very hard to sustain yourself in Seattle if you're on minimum wage," she said. "It's almost like the city is pushing us out. We're pushed out farther and farther back." "There is affordable housing in Seattle, but it's a drop in bucket for a larger problem of rising rent and increased expenses," said Rachel Fyall, assistant professor of public policy at the University of Washington. Seattle, like many cities, has had a boom in housing costs. Many in the tech industry are looking for homes in the city to be closer to jobs and to shorten commutes. Housing prices in the city rose an exorbitant 53 percent in the last four years, according to S&P Case-Shiller Index. Other cities, including Denver, Dallas, and Minneapolis have seen similar increases in housing costs. Seattle area lawmakers are trying to respond to the heavier burden put on suburban poor by proposing a measure that would expand a train line that will reach the farther areas. The Sound Transit 3 Plan would extend public transportation across several counties if approved by voters in November. "Wage earners need to get to jobs, kids need to get to school and daycare," said Mary Jean Ryan, director of Community Center for Education Results. "The train will alleviate the need for a car for many who can't afford it." But other low income individuals have refused to be pushed out of the only home they know. Michelle Hamilton, 50, lives at the Berry Farms Projects in southeast Washington, D.C. She is one of the remaining holdouts of tenants refusing to move out of the city. "Suburbs don't have what D.C does. There's no charter schools, programs for disability, there are a thousand more programs in D.C," she said. "I don't know where they want me to go, but there is no way I'm leaving here." Hamilton said many of her family members and friends moved out of the city, into suburbs, but are now trying to move back. The suburbanization of poverty also presents social barriers to those who have to leave their communities and networks behind and have to join a new community that may or may not be welcoming, said Andrew Greenlee, assistant professor of urban and regional planning at the University of Illinois. "It can be isolating," said Mark Bergel, founder of A Wider Circle, a Maryland non-profit agency that provides social services to low-income individuals. "Social networks are important and when you can't get to a friend or someone you can relate to it can destabilize you," he said. Montgomery County, one of the wealthiest in the nation, has about 70,000 residents who are below the poverty line. "We tend to turn away from what doesn't make us feel good: Poverty is one of those things," Bergel said.